Throughout the 20th century, radio nerds were trying to figure out how to build the perfect headphones. Over-the-ear varieties could get hot and sweaty. In-ear varieties would fall out. And then there were these clamp-ons from 1927, which looked like the least comfortable of the bunch — despite what the manufacturers insisted. 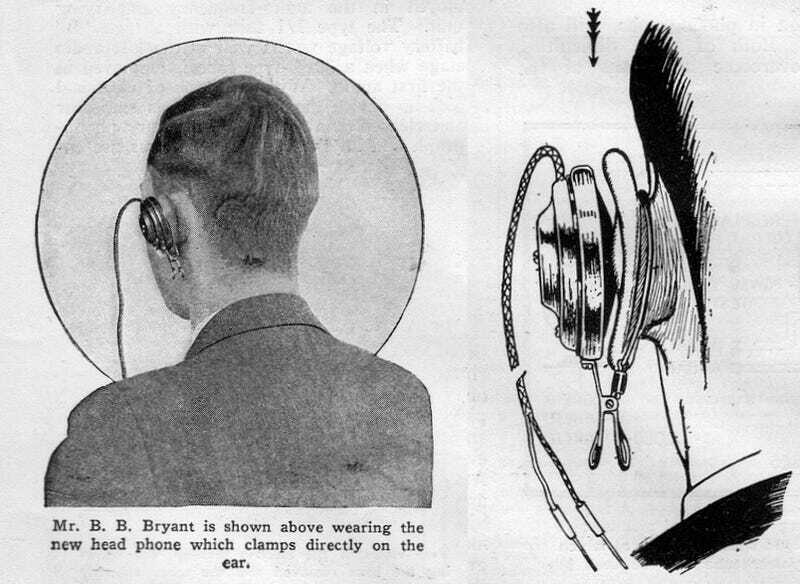 The June 1927 issue of Hugo Gernsback's Science and Invention magazine featured the photo and illustration above, explaining that the French had finally "perfected" the headphone. Given its design, consider me skeptical. "The phone is extremely light in weight and does not inconvenience the wearer," the magazine insisted in text that clearly contradicted what readers were seeing before their very eyes. Today, most mainstream headphones are still obnoxious. But at least we don't have clothespins stuck to our ears. I guess the really depressing thing about looking at headphone designs from the first half of the 20th century is recognizing how far we haven't come.